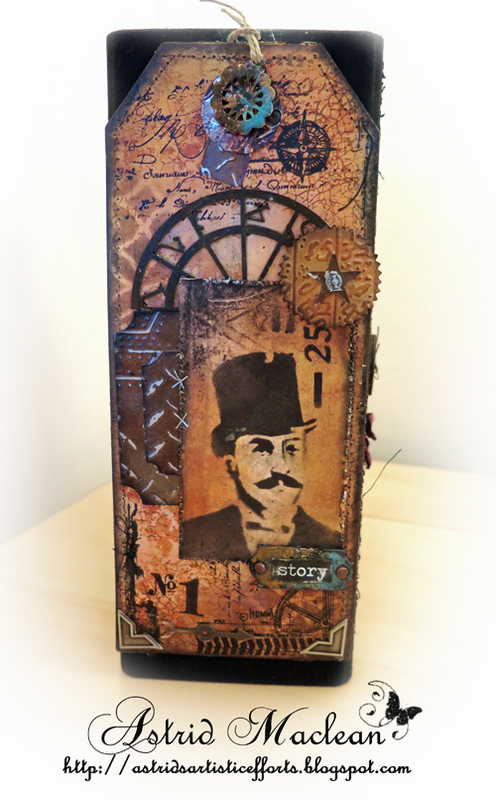 "Use your foil tape, metallic card stock along with your Texture Fades/Embossing Folders to create an industrial creation all your own. Whether it's a background or bloom or metal embellishments; don't limit your paint colour to black..... industrial can look great in all colours! The Creative Guides have created a wide array of industrial projects to inspire you on your journey. I opted to take this opportunity to create something a little different for my hubby for Valentine's Day....an altered frame. 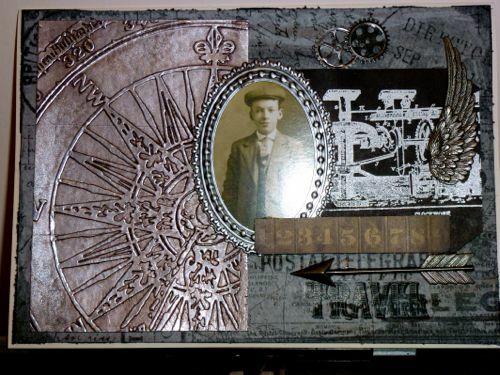 I love adding layers to my design along with vintage and found items; which this piece has in abundance incuding old watch parts, chicken wire combined with metal embellishments from the Idea-ology range. Hope hubby likes his quirky Valentine's gift! For more details please pop by my blog. Well despite being urged to do something colourful I ended up using black and sepia! I love these two (normally three) gents and had them in mind as the original industrial designer gents. If you would like to see some more details (particularly the different shades of black I used!) then hop on over to my blog. for my ex-Navy Brother. You can see more over on my blog. I decided to use an Ikea shadow box to display my industrial butterflies. 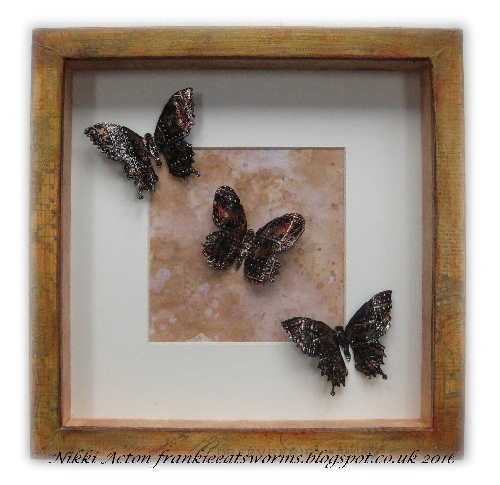 I have used paint and alcohol inks on the embossed trio and decorated the frame with tissue wrap and translucent paints. 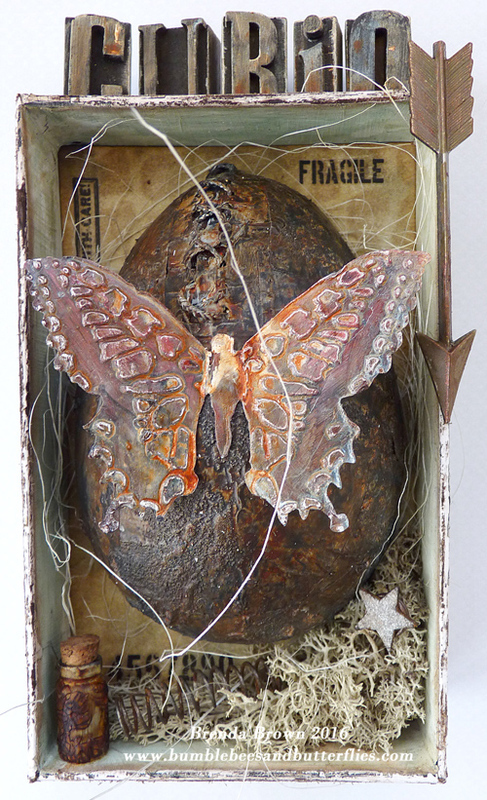 There are more details and photographs at Addicted to Art today. What a great theme for this months challenge. I used some of my favorite things for this canvas. 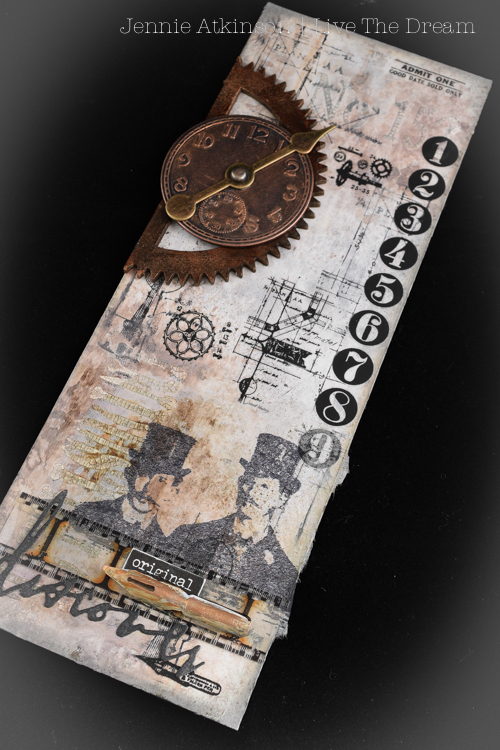 I always love using Tim's Gadget Gears & Layering Stencils so I combined them with one of the great images from Graphic 45's Steampunk Debutante Line. Stop by my blog, My "Crafty" Life on the Internet, to see more details. I had so much fun with Tracy's Industrial theme, my only problem was deciding which one of my million ideas I wanted to use! 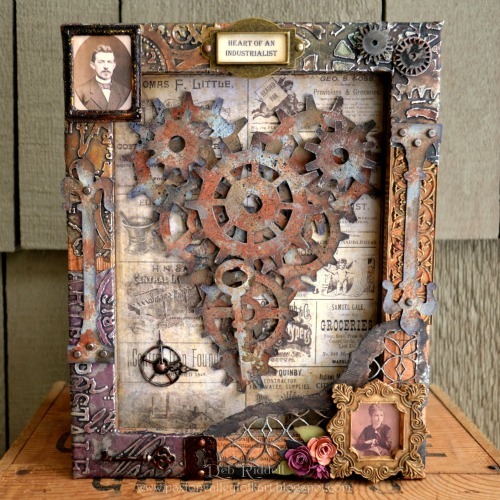 I finally did settle on a design after much debate and created this 'Heart Of An Industrialist' reverse canvas, come on over to my blog to find out how I made it. 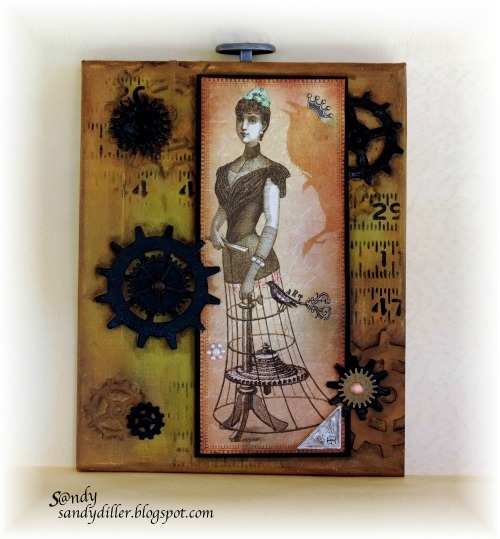 My thoughts are already turning to Spring and Easter and for Tracy's 'Industrial' challenge I have combined lots of things I love - rust, metal/faux metal and altered art with Tim Holtz inspiration and techniques. 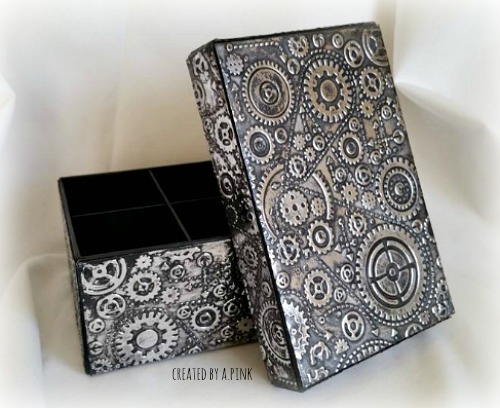 This was such a fun curio box to put together and I took Tracy's advice and used foil tape to make what are normally natural elements look more industrialised. There are more photos over at Bumblebees and Butterflies. Thank you all who joined us for our January challenge, we have all enjoyed visiting your blogs. We look forward to seeing how you are inspired with our February Industrial Challenge. You have until Thursday 25th February to enter and we will then select our random winner who will win a £20 voucher at Country View Crafts and our Pinworthies who we look forward to welcoming as guest designers. You can find all the Creative Guide projects, guest designers, pinworthies and winners on our Pinterest boards. Wow! What an array of "industrial" projects! There is so see and learn here...thanks for the great inspiration as always. Hope to play around. Hugs. WOOOOOOWWWWW! What an amazing line up from the Creative Guides! You ROCKED this theme! I'll be around to see all these fabulous works after the weekend--I'll be out of town. Hugs! Ok, I finally got around to it, and what a lovely 2 hours I have spent visiting all your lovely blogs! You guys rock it! I clicked on the Pinterest link but did not find the winners for the Vint Travel/Luggage winners. Have a BEE-utiful day! The winners are always published one week after the new challenge begins, so the Vintage Travel announcement won't be until next Friday. Have a good day too. oh my freakin flippin soul!!! these projects are amazing!!!! Such fantastic projects from everyone... so sorry I haven't made it round to visit yet. Soon, soon! TY for letting me know that the winners for challenges are posted 1 wk after challenge ends. Entered a card that I used metal eyelets on. Please let me know if use of this type of metal is acceptable for this challenge. Have a BEE-utiful day! There is an indication that challenge ends Feb 25 and then the Linky shows 4 days to end so I was wondering which date is the correct end date? Have a BEE-utiful day!